Tony writes: I apprenticed for a year in Rome and Florence, but that was a long time ago. Back then, I was young and daring and thin. Fast forward to a couple of days ago when I started prepping to teach a homemade pasta class and realized it might be a good idea to practice. It’s not that I’ve forgotten how to make pasta. It’s just that little things get scary as I get older; mid-life culinary crisis kinda thing. Turns out a little time out of the pasta game was not such a bad thing. It gave me some perspective on a process that was once second nature. Back in the day, I worked at pasta – I used to wake up an hour early every day to improve my technique; full disclosure: I wasn’t lighting up the Roman social scene. 1. Make and knead the dough: For the first part of this equation, the question is by hand or by machine. It’s a good debate. The idea of making a pasta dough strictly by hand is lovely. Meditate, zone out, become one with the pasta. That’s how I learned. But what works best? I conducted side-by-side tests and my conclusion is this: a food processor (or standmixer) works best for you and me and most folks who are just pasta day- trippers. To make the dough by hand, you need to create a little volcano/well of flour into which you beat some eggs and olive oil and then slowly incorporate the flour from the sides. It can be a messy process, one that demands a little bit of practice and feel. A food processor used delicately (ie: with short, quick pulses) makes quicker work of the dough with (surprisingly) similar results. For the second step in the dough-making process (the kneading), the goal is to activate the glutens (the primary protein in flour) so they are strong enough to be stretched and cut into long noodles. It’s a delicate balance: they need to be elasticky, but not rubbery or tough either. There is a technique to kneading (heel of the right hand to push the dough, fingertips of the left hand to pull the stretched dough back and over itself), but the truth is you really can’t screw it up, provided you’re working the dough in a ball. Here’s how: Add 1 cup all-purpose flour and 1/2 tsp. kosher salt to a food processor (or standmixer) and pulse a couple of times. While pulsing (or mixing), add 1 egg (beaten), 1 Tbs. olive oil, and 1 Tbs. cold water and continue pulsing (5 or 6 times) until the dough starts to come together into a wet ball; if the mixture is still loose crumbs, add 1 Tbs. cold water at a time and pulse until the pasta pulls together. Transfer to a lightly floured work surface and knead the pasta dough for a couple of minutes so it becomes elasticky (it should spring back when pressed with a fingertip). The technique is similar to one you might use with a pizza or bread dough: pull back with the fingertips on your left hand, push forward with the heel of your right hand. Let the dough rest for 15 minutes. 2. Roll/Stretch: There are electronic pasta machines (and attachments) which can do the stretching and cutting for you. If you have either, great. If not, no biggie. These machines are expensive and unnecessary. 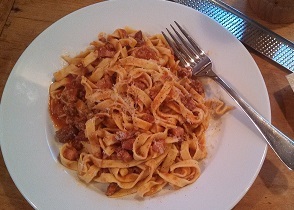 Anyway, a plain old pasta machine (like my Imperia in the picture) does just fine with these steps. The trick is to work the pasta so that it’s strong enough to hold together nicely when stretched: Press the dough down with the heels of your hands to flatten. Adjust the pasta machine to its widest setting and roll the flattened dough through (it might be a little bit stubborn). Fold the pasta in 3 (taking it from each side and folding it into the center), lightly flour, and then pass it again through the machine. Repeat until the pasta becomes elasticky and strong (15 to 20 passes). Now, stretch the dough: roll the pasta, starting at the highest setting and then working down to the 2nd-to-lowest setting (without folding). After each pass, adjust the machine to a thinner setting and lightly flour the dough (so it doesn’t stick as it’s stretched). As the dough becomes thinner and longer, you can cut it into 2 or 3 sections to make it easier to handle. Work it all the way down to the 2nd-to-last setting. Then add the tagliatelle cutter to the pasta machine (the 1/2-inch wide noodles) and cut the pasta into noodles. Set on a lightly floured work surface and cover with a towel for up to 1 hour before cooking. 3. 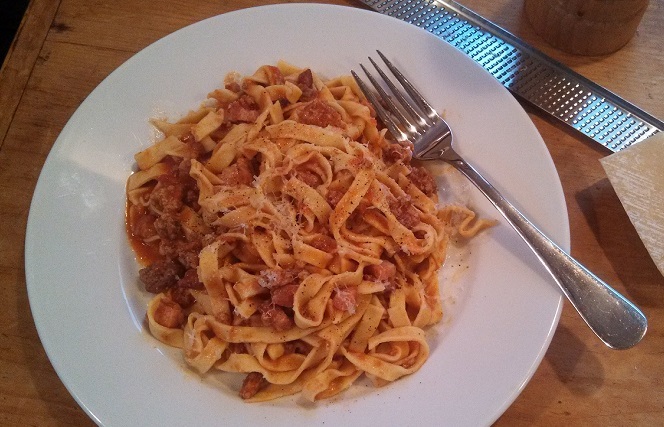 Sauce: Homemade pasta is a luxury that needs little embellishment. That said, you’re kind of short-changing it if you don’t accessorize it with something good. A fine meat sauce only takes about 30 min (10 min of prep, 20 min of cooking). Add to that 20 minutes for the pasta, and it’s one hour of work for something truly special. This is a relatively big batch of sauce, but if you’re making it, you might as well. It will hold in the refrigerator for up to 5 days and in the freezer for 3 months. Quick Bolognese: Heat a heavy-based pot (like a Dutch oven) over medium-high heat for 1 ½ minutes. Add 1 Tbs. olive oil and once it’s shimmering hot, add 1/2 lb. ground pork, ½ lb. ground beef, and 3 slices pancetta (about 2 oz., finely chopped). Cook, stirring and breaking up with a wooden spoon, until the meat browns, about 4 minutes. Using a slotted spoon, transfer to a plate. Add 2 garlic cloves (smashed with the side of a chef’s knife) and 1/4 tsp. crushed red pepper flakes and cook for 30 seconds so it sizzles steadily and becomes fragrant. Add 1/2 cup white wine (or red wine) and cook, stirring to incorporate any browned bits on the bottom of the pot, until the liquid is almost completely cooked off, 1 to 2 minutes. Return the meat to the pot along with one 28-oz can whole peeled tomatoes (pureed in a blender) and 2 tsp. chopped fresh rosemary or thyme. Bring to a boil, then reduce to a simmer, and cook, stirring, until the sauce thickens slightly and becomes intensely flavored, about 20 minutes. 4. Cook the pasta, sauce, and serve: One Italian pasta trick (which should be disclosed more often) is sauteing/tossing a pasta with its sauce for a minute or two on the stovetop before serving so the pasta and sauce marry. Fresh pasta is obviously more delicate than dried, so this process needs to be a little more gentle. One final note: fresh pasta’s cook time is short (1 to 2 min); the pasta is already tender, so you’re just cooking it until it loses its raw gummy texture: Bring a medium pot of salted water to a boil. Add the pasta and cook, stirring, until its color lightens (from bright yellow) and the noodles become completely tender, 1 to 2 minutes. Drain well, then transfer back to the pot, add a couple of large ladles of sauce, and gently toss over medium heat for 1 minute so the pasta soaks up the sauce. Taste for salt and pepper, then serve topped with a little more sauce and sprinkled with more pepper and some Parmigiano Reggiano.